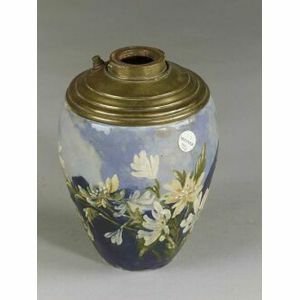 Limoges-style Barbotine Floral Decorated Pottery Oil Lamp Base, incised Hickman. Pair of Tole Urn Table Lamps and a Planter. Verlys Molded Opalescent Thistle Glass Vase. Bronze Fox Mounted Onyx Ashtray, Metal Horse, Elephant and a Metal Classical Figure. 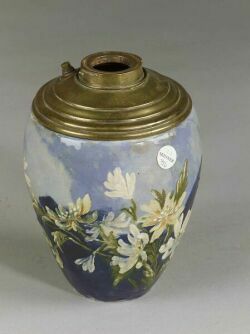 Roseville Pottery Magnolia and Two Water Lily Vases. Set of Twelve Limoges Gilt and Floral Decorated Porcelain Dinner Plates. Set of Five Emerald Glass Wines.